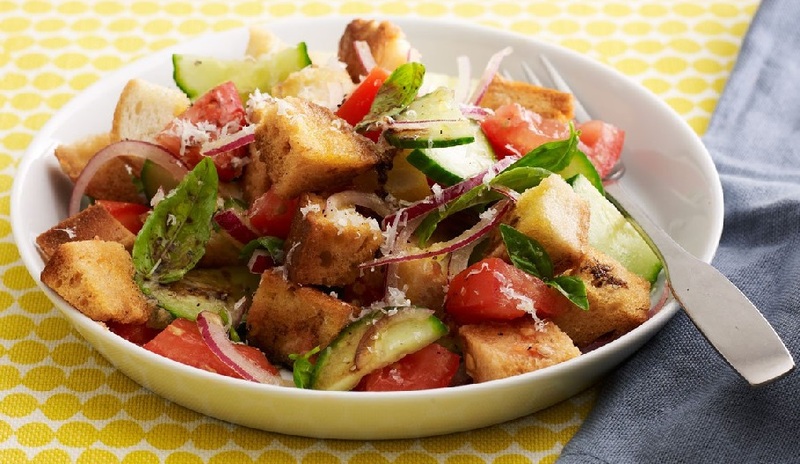 Panzanella: Panzanella or panmolle is a Tuscan salad of bread and tomatoes popular in the summer. It includes chunks of soaked stale bread and tomatoes, sometimes also onions and basil, dressed with olive oil and vinegar. It is also popular in other parts of central Italy. Panzanella was based on onions, not tomatoes, until the 20th century. Modern panzanella is generally made of stale bread soaked in water and squeezed dry, tomatoes, olive oil, vinegar, salt, and pepper. Onions and basil are often added. Cut the stale sourdough bread into small chunks (of about 1 inch). Toast the stale sourdough bread with some olive oil, till golden brown. Blanch the tomatoes in a pot of boiling water for a few seconds. Immediately transfer the blanched tomatoes to a bowl of ice cold water, to stop the cooking process. Remove the skin of the blanched tomatoes. The skins should now peel away easily. Take the toasted bread chunks into a bowl. Season the bread chinks to taste with salt and pepper. Add in the olive oil and half of the red wine vinegar. Chop the tomatoes to medium sized pieces. Add the tomatoes to the bread, along with the cucumber and red onion. Scatter over the finely chopped garlic and add a pinch of salt. Pour in the remaining red wine vinegar, plus more to taste. Serve the Panzanella as an appetizer.